Groundwater Farming: a Blessing or a Curse? Mining groundwater for agricultural use in the San Joaquin Valley has not only created one of the most productive agricultural regions in the United States, but it has also simultaneously altered the surface of the land causing noticeable subsidence or sinking in the region, according to the U.S. Geological Survey. “The maximum subsidence, near Mendota, was more than 28 feet,” USGS reported, citing a 1970 comprehensive survey. Overall subsidence has slowed since the 1970s due to reductions in the pumping and recovery of groundwater, as well as the use of other types of surface water irrigation. According to U.S. Department of Agriculture National Agricultural Statistics Service Pacific Region Office Deputy Director Dave DeWalt, nearly 11.3 percent of the total value of U.S. agriculture commodities comes from California’s prime agricultural region. 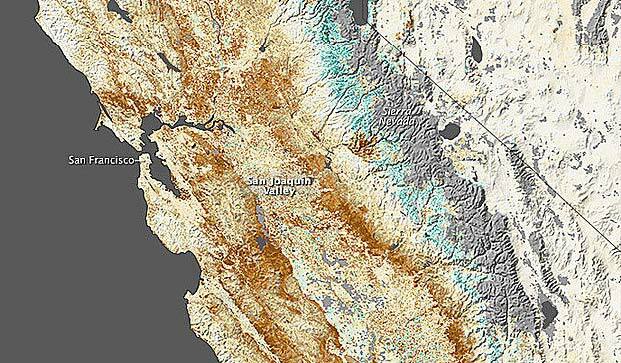 “So far (in 2014) we’ve only seen about one-third of the precipitation we normally would have,” DeWalt said, referring to the Sacramento area. With the drought continuing, food prices will spike. According to Fresno State University Center for Irrigation Technology Consultant Sergeant Green, understanding the utilization of groundwater and the impacts on the Valley is not as simple as it seems. “Water, crops and productivity are all dynamic,” Green said. The current crops using the most water in the region are almonds and alfalfa, he said. The San Joaquin Valley is part of the Central Valley of California, includes the Sacramento Valley and the Sacramento-San Joaquin Delta. This area produces about a quarter of the nation’s table food on only 1 percent of the country’s farmland, USGS reports. According to the USGS, land subsidence in the Valley was first recorded in 1945 by Engineering Consultant I.H. Althouse. The 10,000-square-mile area making up the Valley floor is comprised of continental sediments and includes fine-grained, stream and lake deposits, which are susceptible to compaction, the USGS reported. According to AccuWeather.com Meteorologist Randy Adkins Jr., California has received less than their average rainfall for several years consecutively. “It’s been a multi-year drought,” he said. AccuWeather.com Meteorologist Jim Andrews said the last three winter rainy seasons (October to April) were drier than normal, the last winter being driest of the three. Cumulative rainfall (including melted snow) is as little as one half of normal amount for the three rainy seasons collectively, Andrews said. Andrews added that the Sacramento region has been doused with only 68 percent of their normal rainfall of 54.5 inches. Green said rainfall is not adequate to recharge the groundwater, adding it needs to be stored, applied or recharged in specific areas that allow the capability to add more water than what is being extracted at those locations. In addition, new developments in irrigation are being utilized currently, but the amount of water needed will continue to be based on what crops are in demand, Green said. Author Patrick CavanaughPosted on April 30, 2014 May 31, 2016 Categories Know the issues, Almonds, Water, press releaseTags: San Joaquin Valley Sacramento-San Joaquin Delta Sacramento Valley Mining groundwater U.S. Geological Survey AccuWeather.com Senior Meteorologist Ken Clark Lake Mendocino Ukiah U.S. Department of Agriculture National Agricultural Statistics Service Pacific Region U.S. Department of Agriculture National Agricultural Statistics Service Pacific Region Office Deputy Director Dave DeWalt Fresno State University Center for Irrigation Technology Consultant Sergeant Green Central Valley USGS subsidence Engineering Consultant I.H. Althouse Randy Adkins Jr. AccuWeather.com Meteorologist Jim Andrews Precision irrigation systemLeave a comment on Groundwater Farming: a Blessing or a Curse?